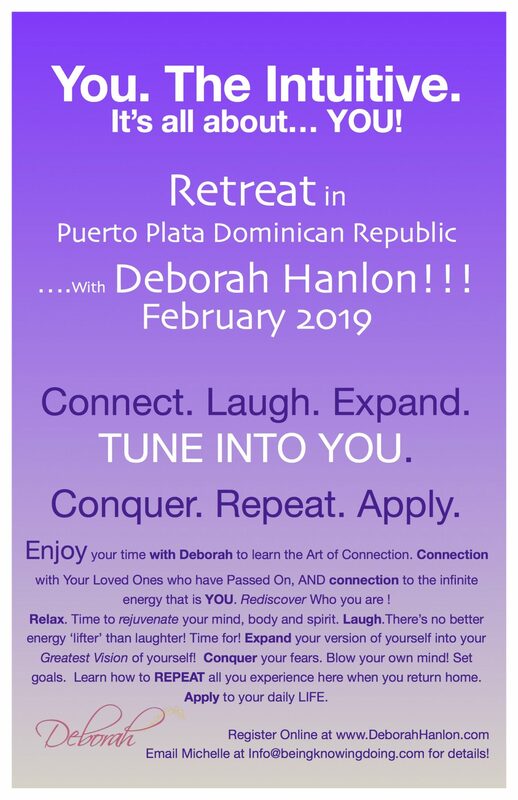 SOLD OUT ~ Retreat in Puerto Plata, Dominican Republic with Deborah Hanlon! It’s time to make your passport arrangements, start thinking about your vacation to-do list and get ready to countdown the days until you Retreat in the Dominican Republic with Deborah Hanlon!! You’ll arrive in Puerto Plata, Dominican Republic on Tuesday, February 5, 2019 and spend the time of your life at the All-Inclusive Lifestyle Holiday Vacation Resort. You will stay in an elegant Presidential Suite. This is YOUR retreat vacation! Stay alone or share your accommodations, we have options for you to choose from! ** While in Paradise, Deborah will help you Connect. Laugh. Expand. Conquer. Repeat. Apply! It’s time to Tune Into YOU! **discounted room rates for couples in a room with a king size bed and double occupancy rates available! ***price per person includes overnight accommodations, top shelf alcohol, all beverages, all meals, transportation to and from Puerto Plata Airport, transportation around the resort, venues, restaurants, entertainment, beach bed and White Band VIP Status! Price per person is as low as $1970.00 per person, double occupancy. Airfare and gratuity are the responsibility of the guest. Retreat is February 5, 2019 – February 12, 2019. SOLD OUT. —->*As a Deborah VIP, you’ll attend a two hour private group Gallery in Deborah’s Private Villa. Allow her to connect you with Your Loved ones on the Other Side! You’ll also be part of an extra group Guided Meditation / Guided Visualization session with Deborah and personalized messages of gratitude focused on mantra/prayer for YOU from Deborah!